DigitalNZ brings together more than 30 million items from institutions such as NZ On Screen so that they are easy to find and use. We added this one from this URL on 13 November, 2012, and last updated what we know about it on 20 March, 2019. This item is a video clip. It was created by an unknown creator on or around the date 1985. 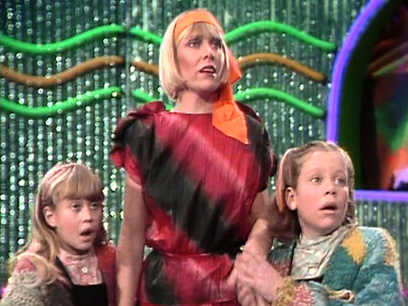 Musician Petunia (Jennifer Ludlam) and daughters Polly and Patch are tiring of their lives as land yachting "gypsies of the motorway" in the first episode of this hyperactive children's fantasy drama written by Margaret Mahy. Their salvation could be a magic house owned by Crocodile Crosby &mdash; a used car dealer with ambitions to be a pirate &mdash; but a devious land agent (Michael Wilson) and a dastardly wealthy couple stand in the way. All powerful narrator Paul Holmes orchestrates the action which features extensive use of music and period video special effects.